Thanks to Sam Hankin of WCHE 1520 AM’s Avid Reader for this great podcast on Witness Tree. Sam is the manager of Wellington Square Books in Philadelphia, a gorgeous independent book store. He was a prepared, smart, questing interviewer who created a lively, interesting new take on the book. Give it a listen! Meanwhile there is news in the woods, too. Leaves! After an on again, off again spring that was both hot and cold, the big oak is finally resplendent in its new robe of leaves at the Harvard Forest. How beautiful to see when I clicked on the Harvard Forest’s web cam under the tree this morning from my study in Seattle, just to see how things were progressing. Ah, the pleasure of long distance phenology! Spring, with no black flies. 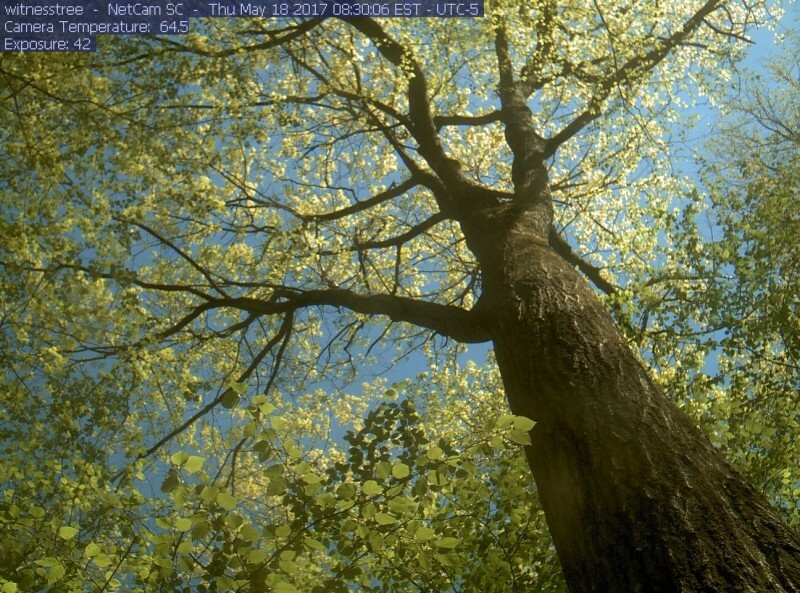 Here is the webcam photo from the Witness Tree Cam at the Harvard Forest from this morning, May 18. Spring has finally truly sprung.